SALT LAKE CITY—DigiTech by HARMAN today introduced the Nautila guitar effect pedal, a new multi-voice chorus and flanger stompbox that enables guitarists to explore a wide range of fresh and innovative modulation sounds. Players can generate up to four chorus or eight flanger voices simultaneously, and then use the DRIFT knob to morph between different modulation waveforms in real-time. The robust feature set also includes true bypass electronics, stereo inputs and outputs, silent switching and rugged construction, making Nautila as practical as it is creative. 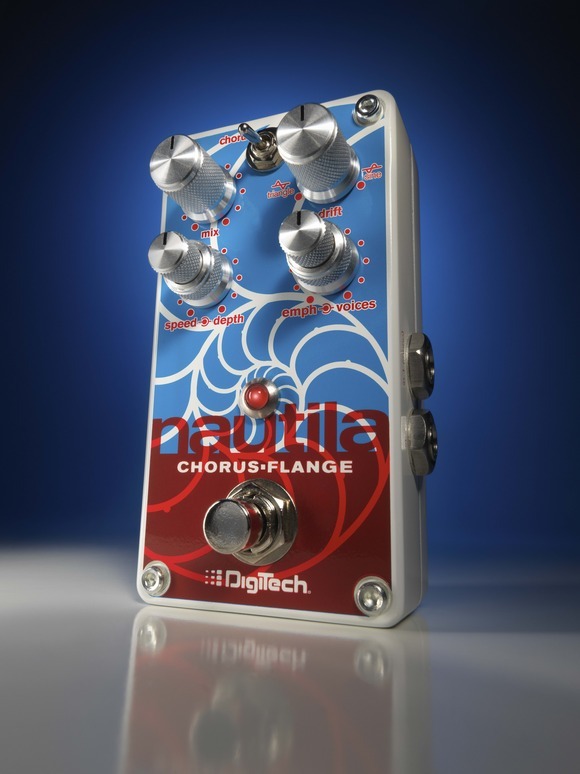 Nautila’s controls include a two-way toggle switch for selecting between the chorus and flanger effects as well as six knobs for controlling effect parameters. The DRIFT knob morphs and changes the shape of the modulation sweep, ranging from swirling chorus to smooth rhythmic waves. Using the VOICES knob, guitarists can add up to four flanger voices or eight chorus voices and create a variety of textural sounds. The EMPHASIS knob controls the high-pass filter for chorus and the regeneration of the effect signal for flanger. The SPEED, DEPTH and MIX knobs control the overall rate, depth and blend of the effects. Nautila also features a unique secondary function for the on/off footswitch. When the effect is active and the footswitch is held, the modulation speed will “ramp” to the maximum speed wherever the effect sweep is in its cycle. When released, the modulation will resume back to the rate determined by the SPEED knob’s setting. Stereo inputs and outputs provide guitarists with greater routing flexibility and allow for stereo amp setups, while true bypass electronics ensure a clean and transparent signal path. Nautila is powered by a standard 9-volt battery or optional external DC power adapter. The Nautila effect pedal will be available in late June/early July 2016 at $187.44 MSRP.